Thank you for stopping by D's Rustic Charm Boutique. We offer a variety of boutique clothing in woman's sizes and plus sizes as well as home decor at affordable prices. We are located in League City but offer shipping within the United States. "I love this Boutique! Such cute clothes and accessories at a really reasonable price and all of the different home decor really gives you aselection of unique items. Denise is such a sweet lady and a pleasure to do business with." "D’s Rustic Charm has the CUTEST clothes, jewelry, and house decor. I have bought several pieces from here that gives my suite the perfect touch! She also does a great job with custom painting furniture!" I am so happy that you were able to stop by my online store. I am a mother to 5 awesome, amazing, and well let me just keep it real, challenging kids. I have an 18, 16, 7 and 6 year old twins. I definitely keep busy with my family but always find time for my boutique which is my woman's cave. I am located off of Park Avenue in Old Historic League City. I carry women's clothing sizes Small to 3X. I also have accessories, jewlery, home decor, custom signs and just started carrying shoes. 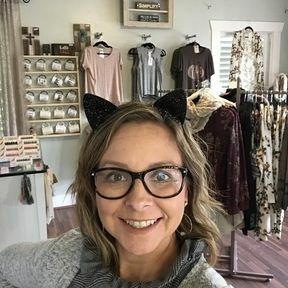 I like to think that what sets us apart from other boutiques is that as the owner I have the opportunity to get to know and connect with all of my customers allowing me to carry things in my boutique that cater to my customers. I am truly blessed to be able to have this store and flexibility to care for my family. I absolutely love my job and have met so many amazing people. Be sure to come by and say hello if you are ever in the area. If you are local to the League City area you can choose in store pickup and pick up your purchase during business hours.